A subwoofer is arguably one of the most difficult speakers to place and adjust in a stereo or home theater system. Subwoofers output audio signals that can easily excite room resonances and create peaks and dips in the bass response. A subwoofer also makes other objects vibrate in the room that discolors the sound from the subwoofer. 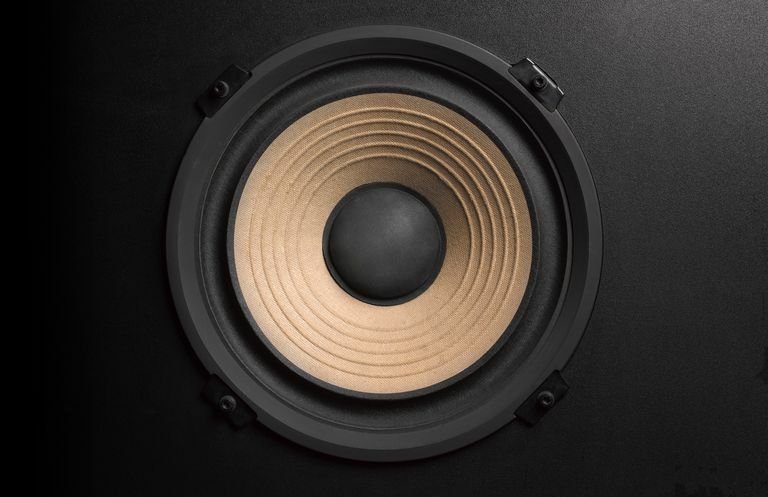 The best solution to prevent peaks and dips is correct subwoofer placement, but vibrating objects creates a problem that requires a different solution. Auralex Acoustics, a room acoustics products manufacturer, has introduced the SubDudeHD, a subwoofer platform that absorbs subwoofer vibrations and reduces secondary resonances in the listening room. A secondary resonance occurs when the subwoofer causes other objects in the room to vibrate, such as tables, walls, and even other speakers. The SubDudeHD is designed to isolate the subwoofer and prevent vibrations from transmitting to other objects. It allows the listener to hear the subwoofer itself by reducing vibrations from other objects. The frequencies that cause secondary vibrations are harmonic frequencies above 100Hz, up to about 250Hz. By controlling secondary vibrations, the intent is that fundamental frequencies from 100Hz and below will be reproduced with tighter definition allowing greater clarity of low bass notes. The SubDudeHD is a 15" x 15" x 2.5" platform wrapped in velour that rests on a layer of dense foam. Auralex also offers the SubDude, which is identical to the HD model except it's wrapped in Ozite, a fabric used in automotive carpets. The two models are identical except for the fabric that covers the platform. Auralex tested the SubDude and SubDudeHD models on a concrete floor. The results of their tests are shown in a Sound Transmission Loss (STL) graph on their website. The graph shows the reduction of harmonic frequencies from 100Hz up to about 250Hz and suggests that frequencies below 100Hz are more accurate, cleaner bass below 100Hz, the most important for deep, extended bass response. My subjective tests of the SubDudeHD were conducted on a carpeted concrete floor and on a wood floor in a home with a raised foundation, which is a more difficult test. A wood floor produces more resonant vibrations than a concrete floor and the raised foundation can exacerbate the problem because of the cavity beneath the floor. Our first test was on the wood floor with the raised foundation. We tested the SubDudeHD with a Canton 8-inch powered subwoofer and an Induction Dynamics 12-inch powered subwoofer while listening to a variety of movies with separate LFE tracks and reference stereo CDs with good bass tracks. We also turned off the main speakers and listened to the subwoofers alone, which ultimately proved less useful than listening to movies and music. With both subwoofers the bass sounded tighter and better defined with the SubDudeHD platform than without. Bass response had improved pitch and resolution. We noticed the same bass improvements on the concrete floor covered with carpet. However, the SubDude didn't seem to reduce vibrations coming from the wood floor and we could still feel the bass. We should note that we used two bass traps in the listening room, which serve to control bass response and absorb room resonances. The room is also acoustically treated with absorbers and diffusers on the walls and ceilings to control sonic reflections. Regardless, the improvement in bass response was definitely noticeable. The improvement in bass response was incremental, not startling or dramatic and the SubDude is an effective tool for improving bass response. It will help your subwoofer reproduce better, tighter bass with improved definition providing you have correctly placed the subwoofer in a location that prevents room resonances. To get the maximum benefits from the SubDude, spend time placing the subwoofer correctly using these guidelines. The SubDude and SubDudeHD, priced at $59 and $69 respectively are well worth the investment. In my opinion, if the bass is wrong, nothing sounds good and achieving better bass response is the first place to start improving your system. The SubDude is part of a comprehensive solution to getting the best bass response from an audio or home theater system and it's very affordable. Dimensions: 15" x 15" x 2.5"